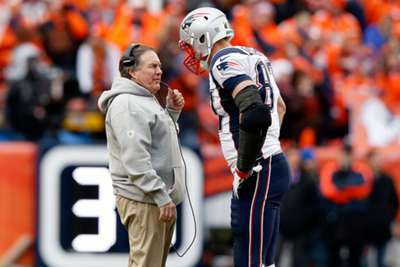 Bill Belichick graciously thanked Rob Gronkowski after the New England Patriots star announced his retirement on Sunday. Pats head coach Belichick released a statement praising Gronkowski later in the day. "It was a pleasure and a privilege to coach Rob Gronkowski the past nine years," Belichick said. "From his rookie year until his final season and through countless times in between, Rob was a major reason why we won games and championships. His elite combination of size, skill, intelligence, toughness and ability to perform in pressure situations set him apart. "Rob's impact on our team and organisation was felt in many ways. In the ultimate team sport, Rob was a great, great team-mate. His production spoke for itself, but his daily attitude, unmistakably positive energy wherever he went and toward whoever he touched will never be forgotten." Owner Robert Kraft also released a statement on Sunday. "In the nine years that I have known Rob Gronkowski, I have never known him to have a bad day," the statement read. "He always has a youthful exuberance about him and is a joy to be around. As a player, he earned the respect of his coaches and team-mates for his hard work, preparation, selfless attitude and the sheer dominance of his game. 'Gronk' quickly became a fan favourite and the most dominant player at his position for nearly a decade. I look forward to honouring him in the near future as both a Patriots and Pro Football Hall of Famer." Gronkowski finishes his career with 521 regular-season catches for 7,861 yards and 79 touchdowns. He retires as the Patriots' career leader in touchdowns and is tied for the second-most receiving scores in playoff history.